Kristina Powell, handwriting expert spills her guts on this important topic after years of research. Hosted & Interviewed by Bart Baggett (as seen on CNN's Larry King Show). Who wants to spot a lying, cheating, dishonest person in just seconds from a just a tiny sample of handwriting? If you need to know "for sure" if you can trust someone (in business or in love), this quick home study course is your answer. Whether you are a spouse, business partner, employee, or friend, HONESTY is a key ingredient in any relationship. Now, you can spot it quickly in over 10 different places using advanced graphology/handwriting analysis techniques. "Now, in just seconds, you can ABSOLUTELY spot a dishonest person without ever having to confront him in a bold-face lie... just look at their handwriting and they will never know you have the upper hand." In this informative and well researched Special Report/Course (which also includes a mp3 class recording) the authors discuss strokes, traits, and combinations that a complete amateur can use and a 20-year veteran probably didn't already know. Much of these "traits" and "strokes" you might have seen before, but never knew they were connected to ethics or dishonesty. "I never knew there was so much MORE to tell about honesty in handwriting. This one hour seminar was packed with more details than 100 page books I've read before on graphology. Thanks Kristina and Bart !" "After hearing your lecture I can see that this is going to help in evaluating tenants and employees." - Jonathan Duncklee, Duncklee Inc. Some of these "secret traits" will be brand new to you. In every case, you will refer to your handouts again and again as this level of "honesty" training has never been revealed in Handwriting University's basic or advanced class materials. You are guaranteed to learn brand new insights into ethcs, lying, honesty, and integrity... since these are all so important in your life. 10 different uncommon strokes that reveal shady ethics and dishonesty. 5 strokes that reveal good ethics and a pension for the truth. Easy to follow graphical descriptions so you can learn quickly. How to evaluate the significance of each stroke to measure the level of dishonesty. How to diplomatically call-out a liar in a business environment. Doing private consultations and dealing with deceit issues in the workplace. Hear and read and download the entire course instantly online. "I've always thought there was more to integrity, lies, and honesty than just the letter 'o'. Kristina's research was solid and easy to understand. It was information NOT published anywhere else." Enroll in the Dishonesty In Handwriting home study course using the online enrollment process below. 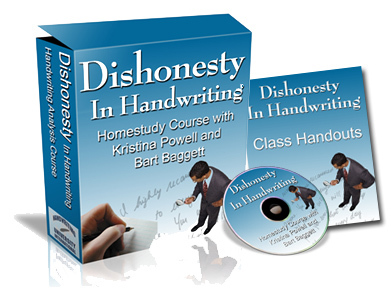 It just takes a few minutes and you can even choose your own password which allows you instant access to this "dishonesty course" but you will also get total access to the new "Handwriting University's Membership Site" as well... as a gift. Your membership "access" remains with all the benefits as long as you remain a member. Everybody asks me, “Bart, it's just 29 bucks, why even give a guarantee?” Why? Because I do not care if it is one dollar, seventeen dollars, or seventeen million, I will always give you more than what you paid for. If you feel that you did not get 10 times your money worth I have to insist that you take your money back. It’s that karma thing again. I offer the same guarantee on all my programs... even the ones that cost over a thousand dollars. Full money-back guarantee. That is why we've been the world's #1 handwriting website since 1996... integrity and happy customers. My credit card company says I can only legally give a 365-day guarantee, so that’s what I do. But if you EVER want a refund all you have to do is let us know. Although refunds or complaints are rare, I have hired one person to handle customer service; Maryann Redhead. support (@) myhandwriting.com Just drop her an email and she resolve your problem or issue a refund quickly, no questions asked. Count me in, Kristina! Enroll me now so I too can learn how to spot dishonesty in handwriting in 10 different ways for the introductory price of just $29. 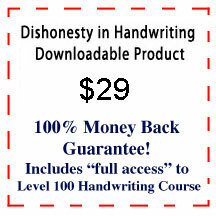 Yes, I want to order the entire Dishonesty in Handwriting course now and pay the discounted ONLINE price of just $29. I will watch, listen, and download the course using my computer. Nothing will be sent to me. Plus I will have access to the entire online seminar to listen to again and again at a later date. So, if I can only listen to half the class, I can come back later and listen to the rest - it's all right there on my computer, whenever I'm ready. I can also download it to my iPod in MP3 format, or listen to it using my computer! Plus, I can print out the entire written material, or read it online. Plus , as a special bonus, I get a full 30 day free access into the level 100 online basic training course which includes audio lessons, free reports, video clips, and even live tele-seminars. $19 Value - free gift. Show me my bonuses now! Get instant access by signing up now, right here. own user name and password. Featured Presenter: Kristina Powell Handwriting University Graduate Kristina Powell is an accomplished healer, business owner and Karate Instructor. After attending the University of Connecticut at Storrs, Ms. Powell became a partner in a karate school and developed an energy technique called Mental Image Makeover. Since then she has helped many people overcome cravings, pain, phobias, ADHD, low self-esteem, stress, athletic performance issues, and more. 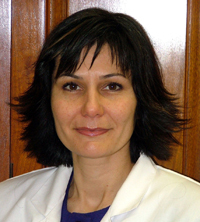 She also holds a master's degree from Clayton College in holistic nutrition and healing. Host: Bart Baggett is the president of Handwriting University International and author of five books. He has been featured on Larry King Live, Fox News Network and 1500 other TV and Radio shows. Bart has been teaching hypnosis and handwriting analysis since 1988. He has hypnotized people across the globe, including India, Australia, and the USA. What is an online home study course? This particular home study course is a combination of a live tele-class and pdf files assembled for online delivery. You get the benefit of listening in on their discussion, reading along with the transcript and following along with the graphics on your worksheet - while learning all about Dishonesty in Handwriting. You aren't enrolled into the Certification Home Study Course, but want to be? Visit here to enroll online or call 1-800-398-2278 right now. Count me in, Kristina! Enroll me now so I too can learn how to spot dishonesty in handwriting in 10 different ways for only $29. You'll be taken directly to the secure shopping cart. ©2018 by HandwritingUniversity.com All Rights Reserved. Or click here for USA and India direct dial numbers.